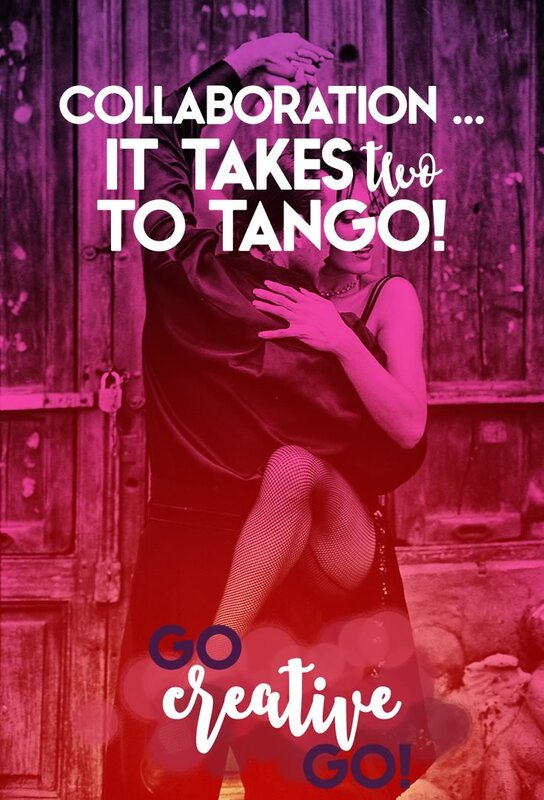 Collaboration: It Takes Two (At Least) To Tango - Go Creative Go! The tango. It’s either an effortless and invigorating display of passion through dance or several sad minutes of someone getting their toes trod upon. The same can often be said about an online business collaboration. A project might begin with the best of intentions, but in the end someone ends up with sore feet or, more likely, sore feelings. Let’s be honest. My snarky delivery and penchant for pithy put-downs of less than savvy and smart marketing and design tactics might lead more than one of my readers to believe that I’m a pessimistic loner who feels I can rely solely on me, myself and I.
That’s actually not even remotely true. I’m fairly sunny and optimistic when it comes to partnering up with a pal or peer. In fact, I’m chatting out a pretty ding-danged bi collaboration with one of my favorite tweeps. I’m also in the process of dialing in the details on a more localized collaborative effort. Collaborations can build and grow community, creativity and even the potential for dollars and cents. However, you’ve gotta take off the rose-colored glassed and remember that collaborations require quite a lot of care and communication! Communication, no matter how big or small, no matter the dollars at stake, is crucial to the success of any collaborative effort. Being able to share the reals and even the feels that go into your collaborative endeavor is a MUST. Sure, you’ve got to keep things on an even keel and keep it professional. But you’ve also got to keep it real. Tap dancing around issues in a bid to be polite and professional just leaves issues unaddressed. If you can’t talk things out with your peer or partner, you’re setting yourself up on a path that will leave you feeling worn and weary. Someone has to lead and one or more partners have to follow. The best collaborations, though, switch up the leads, allowing each partner to lead where and when their skills make the most sense. Switching up the lead on different parts of the collaborative project means no one’s stuck being the boss 24-7-365. The boss has to put in the time and effort on the nitty gritty work, too. Sitting back and leading from a lofty position of assumed superiority isn’t community or collaboration focused. When you switch leads, you keep the best balance. No one feels put upon. You minimize the risk that someone feels a lack of appreciation for their efforts. Caring Is Sharing, Especially In A Collaboration! If the work load, the burden, the worry over the success of the project isn’t share, it’s not really a collaboration. While many of us can dance solo (not me, I’m a trainwreck), there’s no need to go it alone all the time. A dynamic duo can ramp up the reward. But, in order to do so, the collaborative eyes must be on the same prize. It’s important to share throughout the project. Share the excitement, share the fears. Divvy up the costs. Celebrate the wins and together lament the losses. Sharing isn’t always simple. It’s not always easy, either. But hiding from your partner puts the collaboration under more stress than the admission that a deadline might be missed. Sharing the good, the bad, the exciting, the exasperating … you can’t push any of it aside or hide it. The sharing, good or bad, is what builds the trust that keeps the lines of communication open. Communication, Again, Is Critical To Collaboration! Communication in a collaboration is crucial … I can’t say that enough. Sometimes the discussions will be daunting. Sometimes you’ll laugh. Sometimes you’ll want to cry or yell. You might even want to abuse your phone or computer. But when you’re able to share vision, issues and the bottom line with your partner, you’ve got a collaboration that’s on the right path to create something fan-freaking-tastic! Care To Share Your Collaboration Chronicles? I’d love to know if you have any top-tips for collaboration and creating community. There’s no single way to collaborate, no one size-fits-all way to work as a team. Share your smarts with the rest of us, please! Beware The Vampires: Burglars Of Benevolence! Branding With Color: The Eyes Of The Beholder(s) Because I Said So? Better Marketers Just Say No!